Alternative Technology Solutions, the leading CRM and ERP solution and service provider that brings the best of the cloud to manufacturers, today announced that it has added its iQ Configure, Price, Quote application to Salesforce Communities. 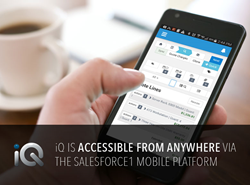 Available via the Salesforce AppExchange, iQ CPQ is a robust configure, price, quote application built specifically to meet the quoting needs of manufacturers, distributors, and those with configured or complex items to quote to customers. “iQ is a unique player in the CPQ market because it was truly built to streamline the quoting process for businesses that have custom and complex items to create for customers,” said Keena. To learn more about Alternative’s iQ Configure, Price, Quote tool for Salesforce Communities, access the webinar recording.